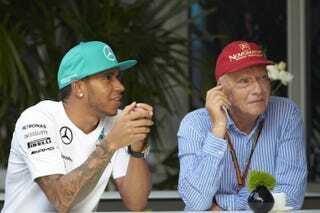 Niki Lauda Called Lewis Hamilton "Unbeatable"
F1 legend Niki Lauda has never sugar-coated his opinions on modern racing, so you know when he’s giving praise, it’s legit. The most recent target of Lauda’s goodwill is current world champ Lewis Hamilton. “This race proved it again if Lewis does not do a mistake in the next couple of races it will be hard for Nico. “These things happen in racing lives; some guy is going forward and the other is still struggling - we have this situation. Yeesh. A bleak forecast for Rosberg. Let’s hope he rises to the challenge.